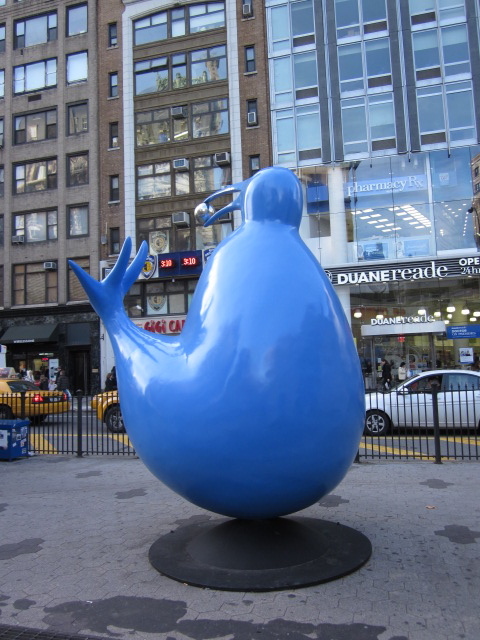 I was walking up Broadway on the Upper West Side when I noticed a massive bright blue sculpture outside the 72nd Street subway station. No inhibitions on display here. I wondered what this enormous spread-eagled blue blob was about so I walked over to inspect it further. 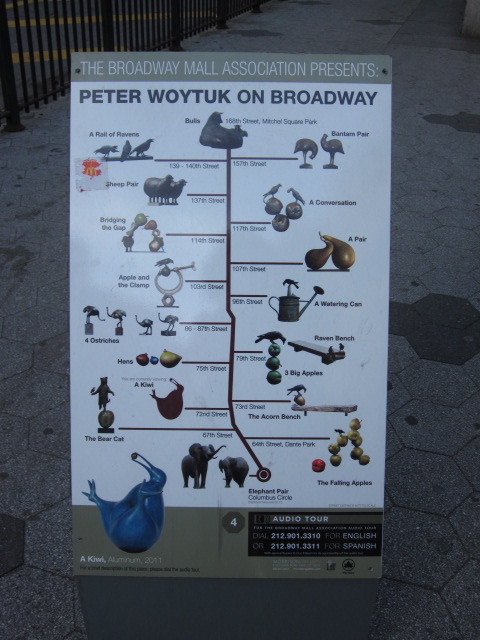 This exhibit is a public art program featuring the whimsical sculptures by artist Peter Woytuk currently on display in Manhattan along Broadway from Columbus Circle up to Mitchell Square Park at 168th Street in Washington Heights. Flipper through the eyes of Fernando Botero? Lad: Why does the sign say kiwi, Mom? Who’s Flipper? Sign more noticeable to people under five feet tall. Me: If that’s Flipper, he sure got morbidly obese. Mom: Do you want a slap? I’m warning you, that’s where you’re headed if you keep it up! The perfect parents on these TV shows were always widowed. They never had a financial worry and were never grieving. The deaths of their spouses were seldom explained, so with all the wisdom I have acquired forty-odd years later, I can only assume that these cheerful single parents must have had extremely crummy marriages to show no signs of remorse. Back to the sculpture, no way was this sculpture of a dolphin. The lad with great reading and comprehension skills that his mother lacked since she failed to read the sign next to the sculpture identifying it as a kiwi, got it right. 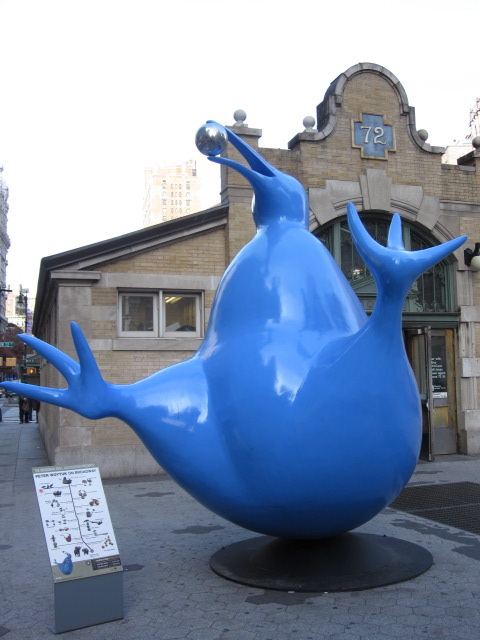 This blue blob in a state of ecstasy is a bird, specifically a chicken-sized flightless bird endemic to New Zealand. 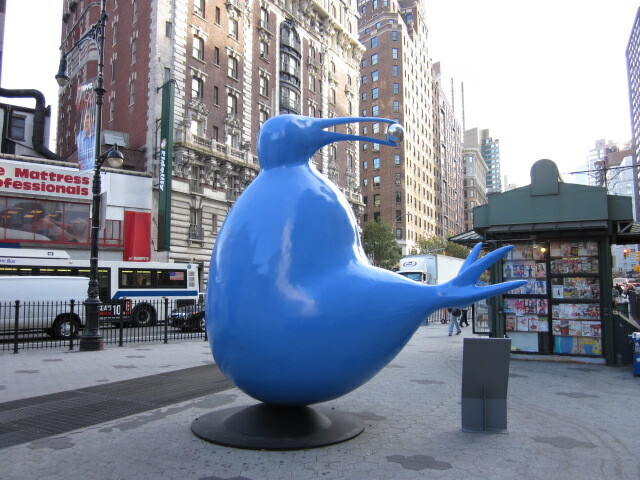 It has the distinction of laying the largest egg in relation to its body size when compared to all other species of birds. It’s also an endangered species. Weasels, dogs and cats love to munch on them. 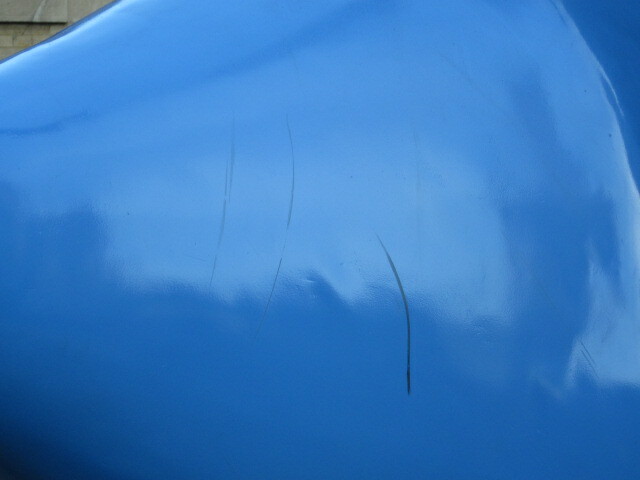 Apparently, on the Upper West Side, idiots with black marking pens find scribbling on them irresistible. This sculpture, made from aluminum and weighing 18,000 lbs stands 12 feet tall and it’s 6 feet wide, so had it fallen off its base and onto the scribblers, they would have been flattened.